FOR IMMEDIATE RELEASE: Bangor, Maine (June 28, 2017) – New England Fights (NEF) returns to the Cross Insurance Center on Saturday night, August 5, 2017 with the fight promotion’s next mixed-martial-arts event, “NEF 30: Rumble in Bangor.” Earlier today, NEF announced the addition of an amateur middleweight contest to the fight card. Josh Jones (2-0) will take on the debuting Carlton Charles (0-0) at a fight weight of 185-pounds. It has taken Jones a mere 24-seconds combined to polish off his first two opponents. 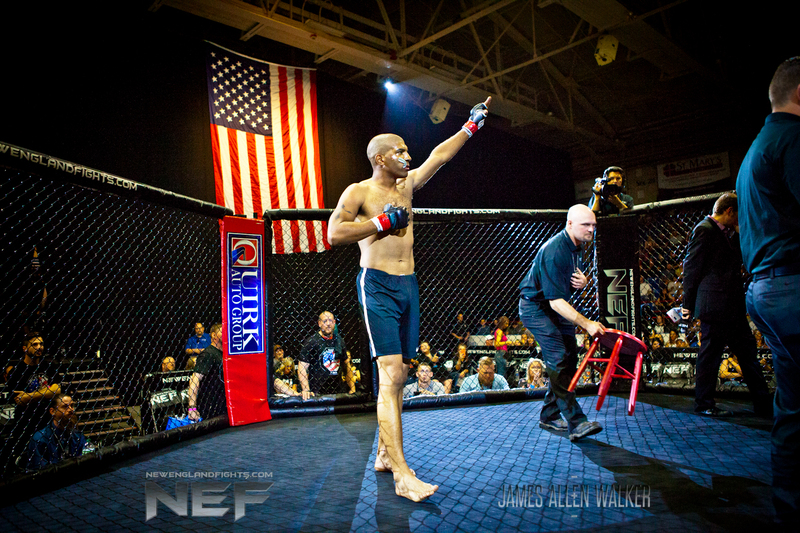 His four-second victory over Anthony Spires (0-3) earlier this month set an all-time NEF record for fastest knockout. Video of the punch went viral almost immediately, giving Jones worldwide notoriety with exposure on major sports websites like Bleacher Report. Prior to joining First Class MMA of Brunswick, Maine, Jones was known for his exploits on the basketball court. He led Erskine Academy to a class B Maine state championship in 2004. Later, as a senior at Husson University in Bangor, Jones averaged 19 points and 11 rebounds per game and was named “player of the year” by the Maine Basketball Writers and Coaches Association. He was drafted by the Rio Grande Valley Vipers of the NBA Developmental League (NBDL). For all his accomplishments on the hardwood and the MMA cage, Jones is not resting on his laurels. His focus now is on the future and his upcoming fight on August 5 with Carlton Charles. Where Jones excelled on the basketball court, his opponent Carlton Charles was a star on the football field. Charles played for Windham High School and was later an assistant coach of the team when they won a class A Maine state championship in 2009. He would go on to play for the University of Maine Black Bears Division I NCAA team. Charles had a career season in 2011, playing in all 13 games for the Black Bears that year with a series of receptions and special teams tackles to his credit. The Charles family name will be familiar to longtime NEF fans as Carlton is the younger brother of MMA and boxing veteran Nate Charles. Carlton has been training with Nate for his MMA debut as a member of team Charles Family Fighting.